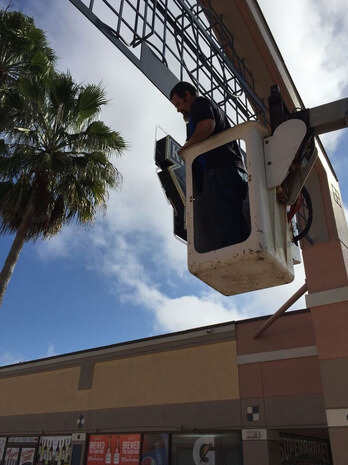 If you have signs that are falling apart or are unreadable, you will hurt your business as time goes on. Property managers and business owners typically put off fixing their signs because they are afraid it will be too costly. The truth of the matter is that you cannot afford NOT to fix your signs. 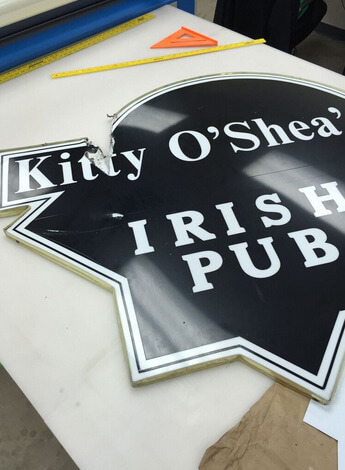 Kitty O’Shea’s realized this, so they contacted Citrus Sign Studio for exterior cabinet sign repairs in Orlando. 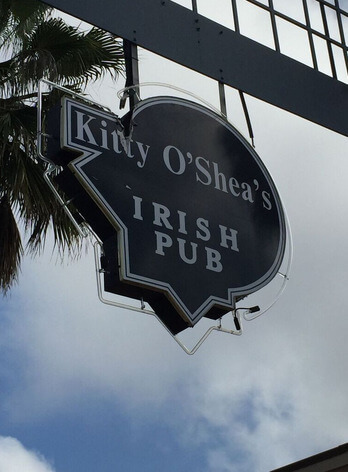 Located on Palm Parkway in Orlando, Kitty O’Shea’s is an Irish pub that attracts a fun and entertaining mix of hospitality employees, tourists, and friendly locals. They regularly have great happy hour prices, drink specials on tap nightly, and live entertainment. They also have a lot for the sports fans, including darts, pool tables, televisions tuned to the big games, and video games. We recommend trying their Buffalo chicken wings. When such an excellent local bar and restaurant contacted us for exterior cabinet sign repairs for Orlando, we grabbed our measuring tape, notebook, and appetite to perform a site survey. Kitty O’Shea’s cabinet sign that served as their primary identification was struck by lightning, which left it in pretty rough shape. We knew just what to do to fix it. After we performed the aforementioned site survey and listened carefully to what Kitty O’Shea’s had in mind for the project, we headed back to our shop to get down to work. They essentially wanted their sign to look the same, only without the nasty gash left in it by the lightning. Fortunately, we determined that the entire sign did not need to be replaced. We just needed to reface it. The client did not have the art files or blueprints for the sign, so we had to create a new face and pattern from scratch. Thankfully, our experts are skilled at that sort of thing. We used our router to cut the uniquely shaped face. Once this was fabricated, we installed it on the original cabinet twenty feet in the air. In the end, Kitty O’Shea’s was completely satisfied with the job we did. Most cabinet signs will eventually start to fade. There are many ways to fix this problem before shoppers begin to think that you have gone out of business. In some cases, we can salvage the acrylic panel of the cabinet and just replace the vinyl overlay and graphics. Other times, we need to install a whole new panel. When we do have to install a new panel, we only use top-quality materials to ensure you will not need to replace your cabinet sign for many years to come. If you have not cleaned out your cabinet signs in years, there could be pests and vermin at work destroying the electrical wiring. We can get in there and thoroughly clean your cabinet to keep your sign illuminated. 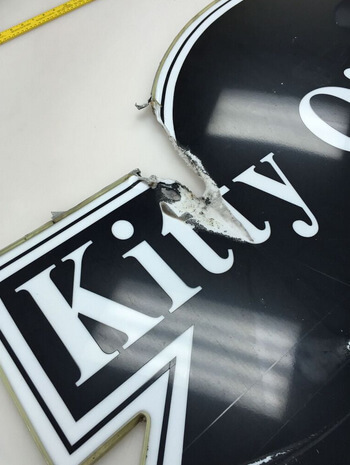 Before your damaged sign can start hurting your sales, contact the specialists at Citrus Sign Studio for sign repairs and refacing. Call today for a free consultation!